About a third of Spotify playlists are actually entire albums. It’s painless to create a playlist dedicated to just one album. Why would you need to do this? On Spotify, you can’t bookmark an artist on the left sidebar and view all his albums at one go in the main pane, like you can with iTunes. Instead, you need to create playlists dedicated to his albums and perhaps file those playlists in a folder named after that artist. 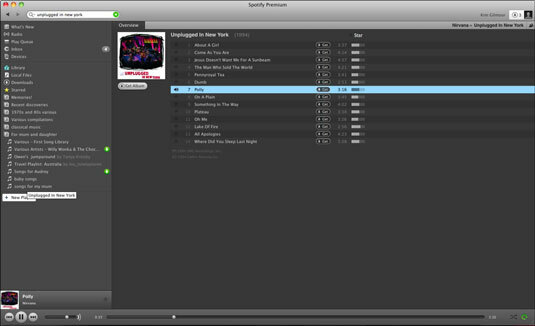 First, search for or browse to the album, such as Nirvana’s Unplugged in New York. To select an album from a list of search results, click the album’s name. Alternatively, if you’re viewing an artist’s Profile page, you should be able to scroll down to the album you want in the discography that’s displayed. After you select an album, drag and drop its title or album art onto New Playlist at the bottom of your left sidebar. After you drop the album on New Playlist, New Playlist changes into the name of the artist, followed by the album title. And all the tracks from that album automatically appear in that playlist.